Dwayne Wade came through in the clutch once again; this time my hometown Pistons were the victims. That block on Stuckey's last possession was questionable, it looked like a foul to me. But Wade deserved all the breaks he got. Final line: 39 pts, 6 assists, 4 blocks, 2 stls, 2 threes, and 56% from the field. Ridiculous. Jeff Van Gundy is why the ESPN commentating crew is entertaining. But that's only because he looked like the most boring/exhausted man while coaching in the NBA. I know I'm repeating common knowledge here, but the Clippers are horrible. The only player that looked like he was trying was Eric Gordon. Jose Calderon dunked. Jose Calderon can dunk?! The Raptors' commentators at CBC are extremely annoying. Michael Jordan cries? Now that's fatherly love. I want to make it clear for all readers out there that I am a die-hard Michael Jordan fan: always have been and always will be. About once a month, I have this irresistible urge to get my Jordan fix. I'll goto Youtube, type Michael Jordan into the searchbox, and watch random videos until my addiction is temporarily satisfied. Today, I came across my favorite Jordan commercial - Gatorade's "23 vs. 39". I remember watching this when it first aired on television; I sat mesmerized at the sight of two Michael Jordans. When it ended, I turned towards my dad dumbfounded and muttered, "Did you see that?". Even having watched it numerous times, I'm still left giddy like a child at the end. Gatorade sparked every basketball fan's imagination with the release of that commercial. Which Jordan was better? The young and freakishly athletic MJ of the 80's? Or the seasoned and wily veteran MJ of the late 90's? Was Jordan more dangerous when he got to the basket at will? Or when he turned into the assassin with the development of his unguardable fade-away jumper? While watching, you want to stop it so you can savor it, but at the same time you want to see what happens next. It's like you can't even handle it all: a brain overload. The dramatic lighting of the court, the playful trashtalk, and the UNC MJ cameo at the end - all tasteful touches to the perfect commercial. I can't fully express the amount of joy this commercial brings me. I can only hope you enjoy it too. The NBA. Where Dwayne Wade Happens. Dwayne Wade has been a demi-god as of late. Fantasy owners every have been reaping in his insane stat lines he puts up every other night; I know I regret not conjuring up some offers to send for him. But look beyond the numbers, and at the man behind them. In all honesty, I wasn't completely on the "Wade 2.0" bandwagon after the Summer Olympics. Despite his superstardom, I still believed he was injury prone, and incapable of leading a directionless and limited Miami team anywhere. I remember watching a Heat game early in the season; they were playing against the Blazers, and it was one of those games that was close all the way til the final minutes. But even though the score was close, it seemed like the Heat were destined to lose that game, and they did. Despite Wade's monumental efforts (36pt, 8asts, 6reb, 3blks, 2stls) that night, he was all that the Heat had. All their offense, all their energy came from this one guy. At that point, I predicted Wade would have a frustrating season. One of those seasons where he has to clock in 40ish minutes a night, put up ridiculous numbers, still lose, and wind up injured half-way into January due to all the wear-and-tear. Wade was good, but I did not think he was that good. Wade has proven me wrong. It's unbelievable what this man can do night-in and night-out. Playing full-throttle at , Wade has been a force at both ends of the court: breakaway dunks, acrobatic layups, highlight-reel blocks, and last-second buzzer beaters. What's even more amazing is what he's done with what would otherwise be a bottom-dwelling team. Wade hasn't had consistent help all year. Shawn Marion struggled with injuries early on, and only played for a while with the Heat before being shipped to Toronto. Chalmers and Beasley have both shown flashes potential, but neither are reliable on a nightly basis. Jermaine O'neal has managed to avoid sitting out thus far, but he's no longer the post presence he used to be. Taking all this along with a rookie coach into account, and you'll recognize the magnitude of Wade's accomplishments this year. 2008-2009 was supposed to be the year of Dwade's "comeback"
I say it's more than that. Wade has reached another level. I'm on the #3 bandwagon. Wade for MVP! So there's like 3 weeks left before fantasy playoffs, and my team is one spot out of the last playoff position. Being in an extremely competitive league where every win matters, I picked up Birdman to get my team some help in the blocks category. And then I came across this video. but yea can we get this guy a bid for the dunk contest next year? I am a Detroit Pistons fan. Though I can't say that I've always been one, I am now a Detroit Pistons fan. One of Detroit's biggest problems has been a problem even through most of their Golden Ages: lack of a dominant post presence. The Pistons don't have anyone that can consistently create havoc for opposing defenses within seven feet of the basket. Rasheed is talented, I agree; he can rebound, block, shoot, etc etc etc...but he doesn't like to bang in the post anymore (I won't even go into all his emotional issues). He'll occasionally grab an offensive board and put it back in. Other than that, Sheed resorts to fade-away hooks and long-range threes. Antonio McDyess is another aging veteran that doesn't do damage in the post. Dice get's pick and pop offense, which only sets him up for those 12-17ft jump-shots. Jason Maxiell wants to bang with the big boys, but is realistically too small to ever be a dominant presence on the block. I know everyone was also getting excited for Amir Johnson, with how much Dumars hyped him over the last few years, but it's abudantly clear now that Amir is primarily a defender (one that can't stay on the floor for more than 10 minuntes because of foul trouble). I feel bad for Allen Iverson; for I guy that's put in so much heart into the game, he's getting the majority of the blame for the Pistons' struggles. However, the AI-bashing isn't completely unwarranted. AI has always needed the ball in his hands to be effective. Along the same lines, he's not meant to be a point guard. For the majority of his career, he ran around the floor with four other scrubs, and did whatever he wanted to on the offensive end. For this reason, AI should be coming off the bench for Detroit and running with the 2nd team, where he can be the focus. It's no surprise that Detroit has won two straight against Orlando and Boston without AI in the lineup. Dumars brought in Allen for his expiring contract. He was a one-year experiment with huge potential-upside, and few long-term consequences. It's safe to say that the experiment is a dud; Iverson doesn't have the "updside" that Detroit needed. Neither Tayshaun nor Rip are the type to beat their man off the dribble and get to the bucket. Most sucessful teams have a guy that can draw contact and get free throws. AI, can get to the bucket, but screws up offensive chemistry. Stuckey can also get to the bucket, but cannot finish consistently enough. There's really not much more to say about this. Detroit is in a slump, but is in no way in a bad position. With AI and Sheed's large contracts coming off the books at the end of this year, Dumars is in a prime position to snipe some quality players through 2009 and 2010 free agency. For Pistons fans, take pride in their recent two-game win-streak, but don't over-read it. Hamilton is playing his mind out right now, bringing back memories of Rip circa 2004. But he's not a guy that can bring the Pistons to elite status all by himself. Stuckey is an up-and-coming point guard, but he's not ready to lead a championship-caliber team yet. The Pistons will make the playoffs, and lose in the 1st or 2nd round to a much more deserving and better team. There's no shame in losing in the playoffs when your team is reloading. 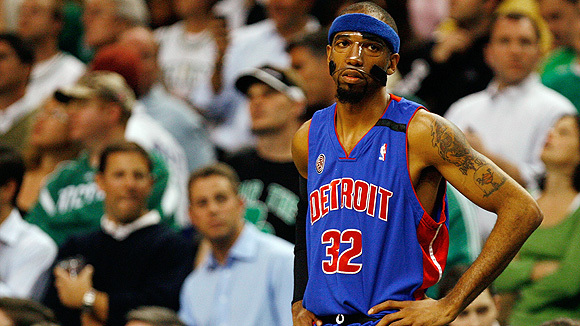 The Pistons' resurrection won't come this year, but is primed to arrive soon.